Direct State Access (DSA) which modifies the way that OpenGL objects (e.g., textures, FBOs, etc.) modify their attributes. This approach mitigates the sometimes confusing "bind-to-edit", making it much more straight-forward to understand which objects are being updated. 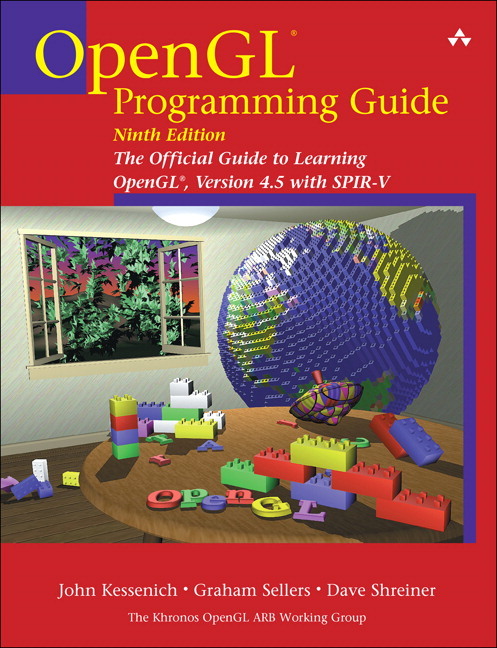 SPIR-V, The Khronos Group's compiled-shader representation, which allows authoring shaders in just about any programming language – provided there's a SPIR-V backend to the compiler chain. SPIR-V is also one of the major components of Khronos' new Vulkan API. Expanded discussions of GPU computing (compute shaders) and rendering algorithms, with a focus of doing more work on the GPU. 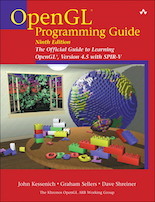 As always, the Red Book guides the reader from the essientials of using OpenGL including introducing vertex and fragment shaders, through advanced programming techniques using geometry, tesselation, and compute shaders, and all the other features available in OpenGL. The source code for the 9th edition is now hosted on Github, or you can download a ZIP archive of the Github repository here.